Aquarium Ornaments - 7 Tips How To Decorate Your Aquarium! 1. Fish love to hide. Giving your fish places to hide should be the focus of your fish tank ornaments. Allowing them places to hide gives them a feeling of security which, in turn, lowers stress. The less stress a fish has, the longer they will typically live. 2. Aquarium ornaments should include natural items. Live plants can be purchased for both fresh and saltwater. These help maintain oxygen and carbon dioxide levels, and some species take in harmful nitrates and nitrites. 3. Aquarium rocks can be used for hiding places and, if you have bottom feeders, they give good algae something to cling to. 4. Aquarium ornaments can also include made man products such as plastic plants, or artificial structures. These also provide hiding spaces and they help make the tank feel more like a habitat. 5. Air pumps can be connected to a variety of tank decorations that pump oxygen into the water. These bubblers are great aquarium ornaments for both salt and freshwater tanks, big and small. 6. 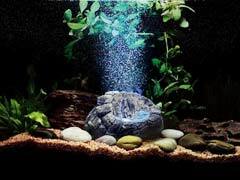 Some items commonly thought of as saltwater aquarium supplies can also be very useful in larger freshwater tanks. One such item is a current pump. These create the feel of a current inside the tank, which also helps lower stress by giving the feel of a more natural habitat. 7. Although they aren’t considered decorations, thermometers are very important in any size tank. They can be found built into aquarium ornaments or just attached to a suction cup. Monitoring temperature is far easier with a readily viewed thermometer. I would avoid the sticker thermometers since they are inaccurate at best. Finding meters that stay in direct contact with the water and are part of a decoration is pretty easy at most any pet store.